As women mature, their tastes and styles change. The fashions and accessories they once loved may no longer appeal. And many women dread inadvertently making themselves look older than they actually are by poor choices in clothing or jewelry. If you’re frozen by indecision, don’t worry. The right choices in jewelry can be elegant and flattering no matter what your age. Keep in mind is that real jewelry made of precious metals and genuine gemstones is the best way to go for a mature woman. These materials have a lustrous finish, weight, and sparkle that costume jewelry simply can’t match, and they properly convey the status an older woman has achieved. There’s no need for this recommendation to break the bank, however. Sterling silver and semiprecious gemstones can be quite affordable, and even high-end pieces can be purchased at auction at below-market prices. The best way to convey elegance and good taste is to keep your look simple. Wearing too many overstated pieces of jewelry at once can look overdone. Decide where you want the focus of your look to be, pick a piece that will draw the eye—like a beautiful short statement necklace or pendant, or a wide bangle—and then keep your other jewelry on the understated side so as not to distract from it. Many older women will have beautiful pieces of jewelry in their collections already. It is easy to update a favorite look by combining a new piece with something you already own. You can try mixing metals in a set of stacked bracelets or rings, for example. Modern looks tend to avoid strictly matchy-matchy pairings, so experiment with mixing things up. You can also consider a new twist on a look you love, such as black Tahitian pearls instead of traditional white. It’s best to avoid heavy earrings, as these can weigh down and elongate your earlobes. Smaller or thinner hoops, like a set of diamond “huggies” or hammered silver hoops, are a good choice, as are gemstone studs in all colors of the rainbow. Having sparkly earrings can bring out the twinkle in your eyes. Consider picking a hue that will enhance or complement your eye color as well. As with any fashion choice, consider accentuating your best features and downplaying anything you feel self-conscious about. For example, a cocktail ring will draw attention to your hands, while a statement necklace layered over a higher neckline will focus the eye on your face. However, there are no absolute rights and wrongs when it comes to what works best for you. 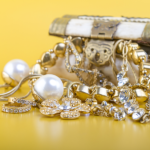 If you’re looking for fine jewelry to update your look, buying at auction brings the greatest possible variety at the lowest possible prices. The live online auction at Auction King is accessible from wherever you are, and they are constantly updating their selections with pieces featuring both classic gemstones (rubies, sapphires, diamonds, and emeralds) as well as gorgeous trendsetters (tanzanite, alexandrite, morganite, and more). Bids start as low as $1. Sign up for a free online account today.